Few cars are fortunate enough to have a rich, fascinating history such as that of the Mercedes G-Class. The Geländewagen, or G-Wagen as it is more affectionately known by its fan base, was originally conceived in the 1970s as a military purpose vehicle for the Shah of Iran. By the time it was ready for active duty, however, the Shah was in exile as a result of the 1979 Islamic Revolution, and that became the end that. Over the course of the next decade or so, Mercedes would transform the G-Wagen from a simple military vehicle into a full-blown luxury SUV for wealthy civilians. The result is the G-Wagen as we know it today. 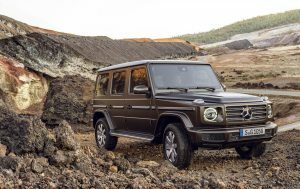 The latest G-Class represents the first full-blown redesign in the model’s lengthy history, though that isn’t exactly immediately apparent at first glance. From a visual standpoint, the G-Class maintains the overall boxy profile and aesthetic details of its predecessor. Physical change comes as easily to the G-Class as it does to the Jeep Wrangler, but that’s to be expected from a long-running icon such as this. In fact, the lack of change is a large part of its overwhelming appeal. It looks like nothing else on the road and makes a strong statement wherever it goes. Unlocking the doors triggers what sounds like the cocking of a bolt-action rifle as the door lock actuators do their thing. The doors open and close with a satisfying, hefty feel that’s reminiscent of the over-engineered, tank-like Mercedes cars of yesteryear. The interior offers an impeccable blend of old-school touches mixed with modern tech and luxury. Longstanding G-Class features, such as the passenger grab handle and trio of locking differential buttons, remain, but they have been beautifully integrated into a luxurious, technology-packed environment. Everything from the Mercedes dual-widescreen infotainment system to the hot stone massaging seats is available here. Bottom line: This is an interior that feels worthy of its six-figure price tag. Scaling the climb into the driver’s seat takes a good amount of effort, but once seated, the driving position is all dominating. The G-Class offers a commanding view of the road like few other vehicles. With its massive brick-like proportions, truck-based underpinnings, and solid rear axle, it’s no surprise that it feels quite wallowy with plenty of body motions and wind noise. That being said, the G-Class is adequately comfortable and surprisingly easy to drive. Part of its newfound refinement can be attributed to its modern independent front suspension, steering rack, and stiffened chassis, which were all a part of the 2019 model year makeover. On a scale from Wrangler to Range Rover, the G-Class tips much closer to the latter than ever before, which will likely be appreciated by most buyers. The G 550 tested here comes equipped with a twin-turbocharged, 4.0L V8 engine matched to a 9-speed automatic transmission. The V8 produces 416 horsepower and 450 lb-ft of torque, which is enough for an impressively quick acceleration run from 0-100km/hr in only 5.9 seconds. As is to be expected, fuel economy is quite dismal with an average observed rating of 18.0L/100km in mixed city and highway driving. Far more impressive than the G 550’s performance, however, is its legendary off-road capability. Even though a tiny number of owners will ever use the locking differentials and low-range transfer case, it’s nice to know that the G-Class is still more than capable of scaling seriously treacherous terrain if desired. The G 550 has a starting MSRP of $134,000 and can go for well north of that figure with options. The most popular upgrade will likely be the move up to the AMG G63, which swaps the G 550’s engine for a hand-built, AMG unit producing 577 horsepower and 627 lb-ft of torque. 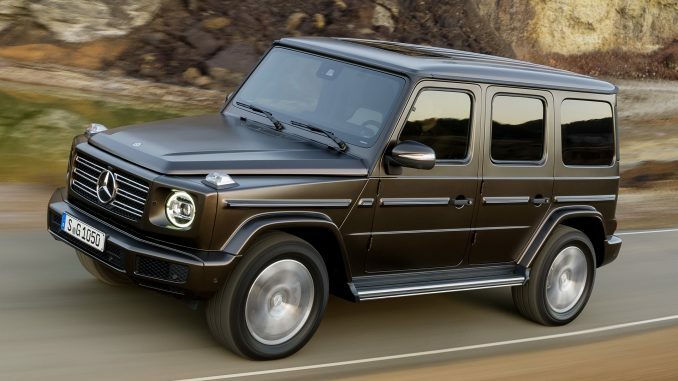 It’s as fast as it is unnecessary, but given the fact that the G63’s starting price of $167,000 is only about $10,000 dearer than that of my heavily-optioned G 550 tester, I can’t see too many prospective buyers passing up on that temptation. The G-Class comes with more than its fair share of compromises, but all of them pale in comparison to its sheer desirability. Anyone with the money to spend could easily go with a big, cushy, Range Rover or something similar if ultimate refinement were the goal. Still, demand is so high and profits are so great that Mercedes simply cannot build enough of them. The G-Class is the irrational choice, but for those who are totally smitten by its appearance, image, and charming character, nothing else compares, and indeed, nothing else will do.